"It starts with a cough and ends with death". The latest thriller from director Steven Soderbergh, tells a story that is incredibly scary and close to home. It plays on the very well fears of death by disease on an apocalyptic scale. As the MEV-1 Virus sweeps through the planet, you get the very uncomfortable feeling that every last person on earth is at risk of this deadly disease that ravages the human body and kills within days. With an all star cast including Matt Damon, Gwyneth Paltrow, Laurence Fishburne, Kate Winslet and Jude Law. I will not spoil the movie by telling you which of the cast survives and which succumbs to the disease, but lets say Soderbergh is not afraid to kill off his stars. In an age of international air travel, public transport and the all the scary elevators no where is safe. With deaths in London, Hong Kong, Tokyo and wide spread across the USA. 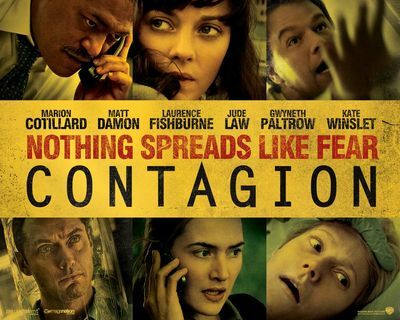 After watching this movie and seeing how easily the disease is spread you will hesitate before touching a car door or elevator button again. As the movies catchline goes "Nothing Spreads Like Fear"
Catagion is a movie well worth watching.